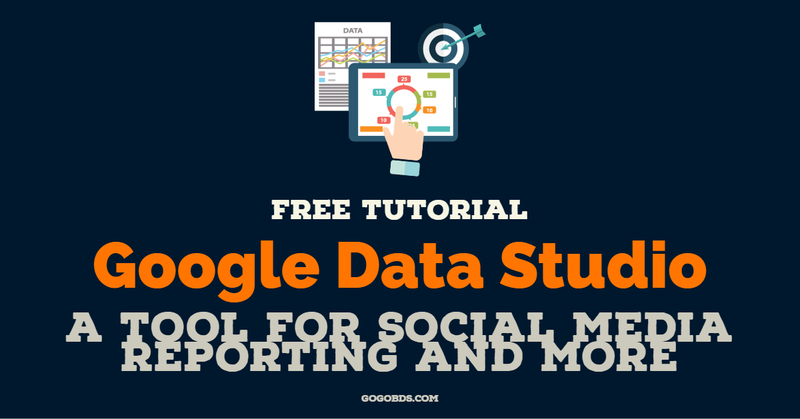 Best way to use Google Data Studio For Facebook Campaign Reporting. Facebook data… amaright? Google has a better way to get a good idea of whats going on and its great for reporting as well. Its called Google Data Studio. GoGo has been in the Digital Marketing game for as long as the game has been around. Let us show you how we use Google Data Studio to give our clients easy to read reports for their website, Facebook, and Instagram. 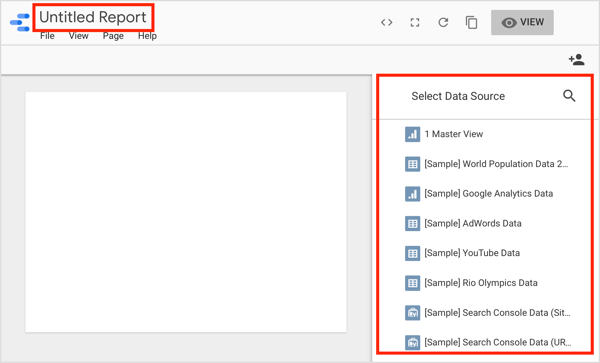 Import your sources into the Google Data Studio. 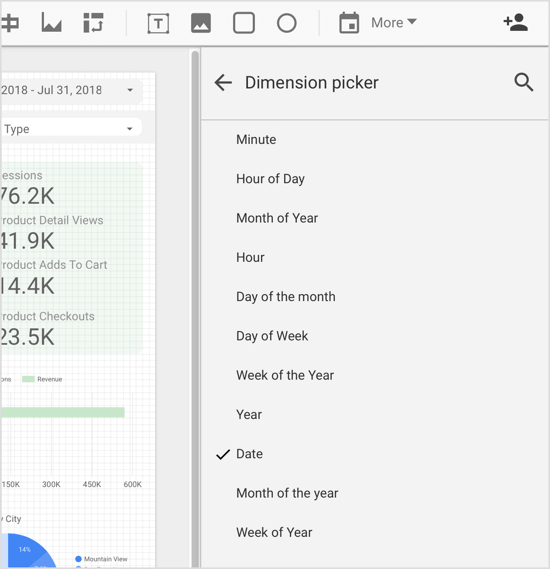 Google Data Studio is free. If you don’t use it, you’re not maximizing your numbers for yourself and for your customers. Remember, if it can be measured, it can be improved. This free tool lets you visualize data to create good looking and insightful reports. you can share these amazing reports with your clients and team members so that everyone knows whats going on and gets the big picture. 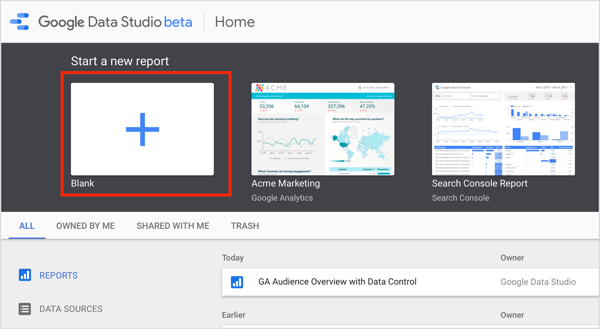 Google Data Studio works with just about any data source you want to use such as Google Analytics, Facebook, Instagram, Google Ads, and more. It’s a must-have for your business no matter how big or small because no matter how big or small I bet you want to grow, right? Okay, the first thing you’ll need to familiarize yourself with is connectors. They are exactly what they sound like, a way to connect to something -Data in this case. There are three different kinds of connectors you can import: Google Connectors, Partner Connectors, and Open Source Connectors. 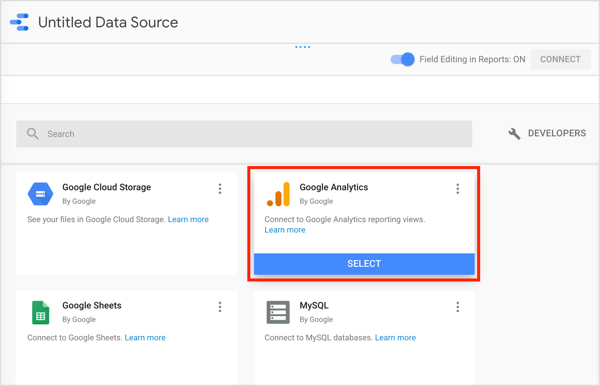 Import the Google Analytics data. As you might imagine, these two work together quite well seeing as how they are both Google. 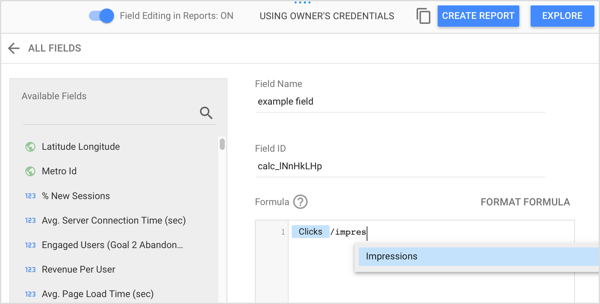 To access Google Analytics data from Google Data Studio, you need to create a data source with the desired data. To do this, open Google Data Studio, and on the left, click the Data Sources tab. Then click the + button on the right. Now on the next page, you’ll want to scroll down to Google Analytics. 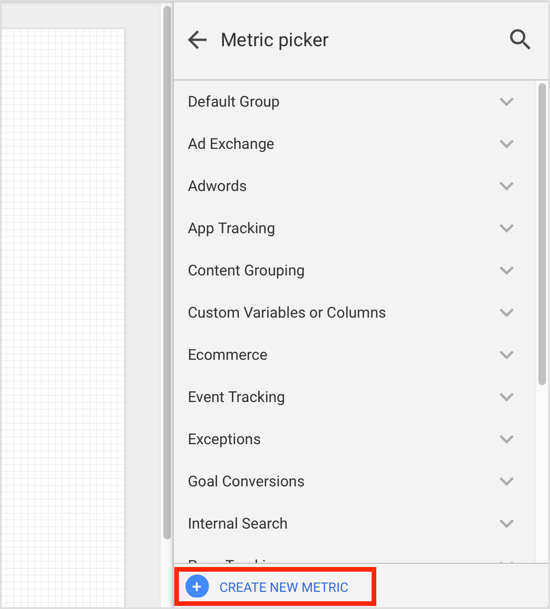 Next, choose the Google Analytics Account, Property, and View you want to use and click Connect. When you click the connect button, you’ll notice the fields panel. The Fields Panel has all your data source’s metrics and dimensions. Now for those other guys. Facebook, Instagram, and your other “Non-Google” data is just as important as your Google Analytics. So we need to get that imported as well. Okay, I know what you’re thinking… “That’s a lot of work takes too much time. You’re right. There’s an easier way. Another way to go is Partner Connectors. These connectors let you link many different data sources to GDS. This can be done, for example, by providing you with a Google Sheets template that will pull data from different sources and update them automatically. 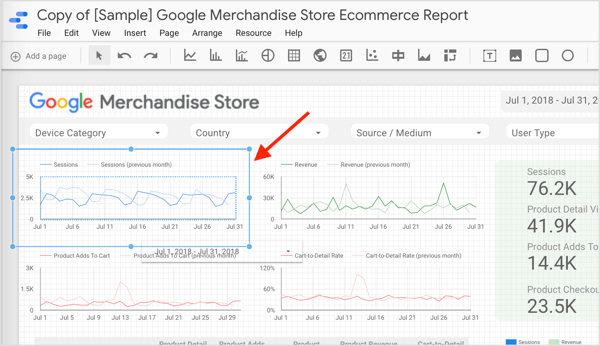 The Google Sheet is connected to Google Data Studio and lets you access an automatically updated report with different data sources. Time to start reporting. Let’s make our first one. Now that you’ve connected everything, You’re ready to create your first report! You can adjust the data to create a workflow for everything you’ve imported from your Facebook and Instagram campaigns. This is where it gets good. The graphs and table you’re used to are boring. With GDS you have all sorts of crazy customization options. You can tailor reports to your specific needs and tell your story in a uniquely visual way. If you want to start from scratch then there’s that option as well. 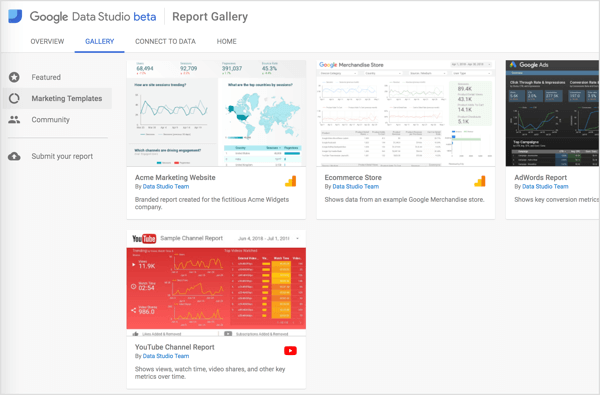 If you want to create a new report from scratch, go to the Google Data Studio home page and click Start a New Report on the Report tab. On the next page, select your data source on the right and click Add to Report in the pop-up window. Then type in a report name at the top of the page. 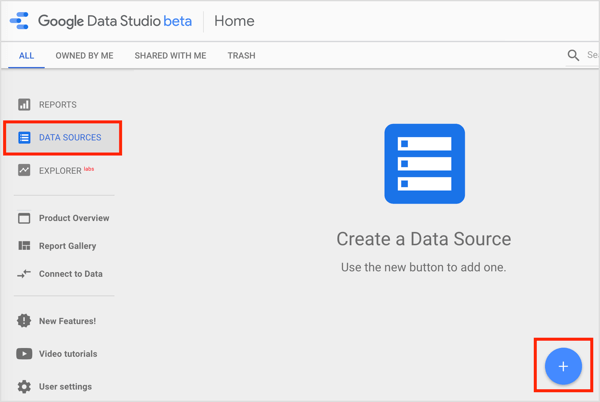 If you’d rather work from a pre-built template, click the template you want to use on the Google Data Studio home page. On the next page, click Use Template. In the Create New Report dialog box, select your data source from the drop-down menu on the right and click Create Report. Data Studio then replaces the template data with your data. Now, you can customize your new blank report or template to suit your business needs. Most of the charts offer various breakdowns to choose from, depending on the dimensions you’re interested in. All of the usual spreadsheet features like pivot tables are easy to create. To add a chart or table, click the icon for the element you want to create. 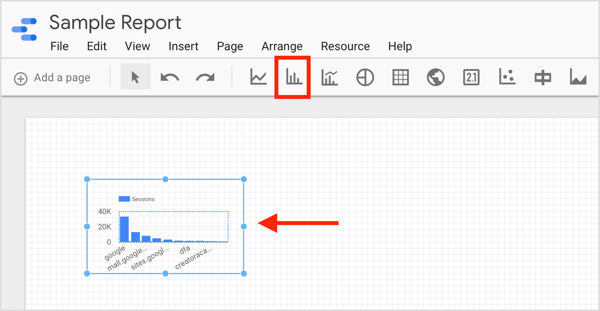 Then draw a box in the area of the report that will host the chart. 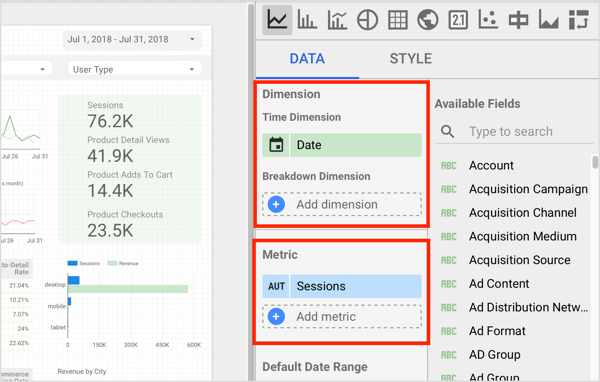 Google Data Studio then adds the chart or table to your report and automatically selects the dimension and metric. You can customize these settings as described in the next section. ProTip: If you want to provide an in-depth analysis of different aspects of your report, you can create a multi-page report. To add a new page to your report, click the Add a Page option in the upper left. 4. And in Fourth Place!! Customize the Dimensions and Metrics for Components. There are two different parameters in your reports: dimensions and metrics. Metrics are quantitative pieces of data such as the number of clicks, or the total cost or CPM. Dimensions are categories that define the metrics in relation to them. Popular dimension choices are day/campaign/device. You can choose to aggregate metrics using various methods (SUM, AVERAGE, COUNT, COUNT DISTINCT, MIN, MAX) and display metrics differently based on what you’d like to see in the report. To illustrate, select Percent of Total to see how much each dimension contributed to a common goal. The component properties panel opens on the right side of the screen. Click the Data tab to see the dimension and metric for the component you’ve selected. If you want to change the dimension for the selected component, click the current dimension (Date, for instance) and Data Studio will display a list of eligible fields. Now select the dimension you want to report on. You can change the metric used for the selected component in a similar way. Click the metric to see a list of eligible fields to choose from. If the metric you want to use doesn’t exist by default, you can create the metric as a calculated field. To do this, click Create New Metric at the bottom of the Metric Picker (as shown above). 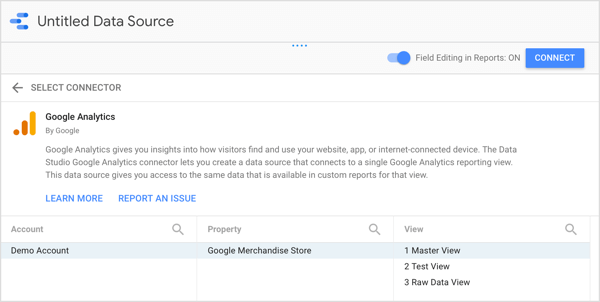 Alternately, navigate to the main Google Data Studio page, click the Data Sources tab, and select your data source. On the next page, click Add a Field in the upper-right corner. Now type in a field name and build your formula in the Formula box. you can do a lot with a custom field. The easiest one is to use existing numeric fields for mathematical calculations. You can also apply functions to create advanced calculated fields and include parameters like time and location. Or you can create CASE statements to use conditional logic (if/then/else) to determine the field values. When you’re done setting up your calculated field, click Save. WHAMO!!! You can now you use this new field in your report. There are many many more options you can use. GDS also lets you tweak, filter, blend and share your data for clients. It is quite an amazing tool. GoGo BDS can also do this for you if you don’t want to mess with it. Feel free to contact Tara for more information! GoGo BDS Covers Digital Marketing of all facets, let us show you what we can do!